For those of you who are readers of the JuiceBar, the following essay is part of a Web 2.0 exercise in presenting a popular culture artifact for the graduate course Teaching & Learning Historical Thinking, part of the George Mason University College of Education and Human Development Secondary Education (SEED) Program. The requirement is a Web 2.0 exercise that could be used in a high school history course. In this case, I’m using this blog post to engage students on how music can provide insight into history. I hope you enjoy it. And feel free to pretend you are in my high school history class and offer your thoughts on current songs that give insight on what is going on in today’s social, economic and political culture. Folks, the topic today is popular culture. Specifically, what you can learn about history and a historical period through popular culture. By popular culture, I thinking about things like movies, fashion, and music. In this case, let’s take a look at music. Music is often both a reflection of and reaction to the political, economic, and social trends in a given period. Take the issue of war and conflict. In American history, we have songs of the American Revolution, Civil War, World War II and the Vietnam War. If you’re interested, just try “Googling” any of those wars and “music.” You’ll get some interesting lists. Most of the songs of earlier wars were written to support the cause. But there were others that gave voice to the opposition to war.Others oppose it. If you’re looking for something that typifies the latter, listen to my favorite anti-Vietnam anthem, Edwin Star’s “War” which was popular protest song during Vietnam. It is a classic. In this case, we’re going to focus on songs that reflect the economic developments. This was particularly true of the songs of the 30s and the Great Depression. The depth and scope of the Great Depression are hard to appreciate today. At its height nearly a quarter of Americans were unemployed. Amidst these dark times emerged a lot of upbeat music (most notably, swing music). In that case, one can interpret music as a reaction to the downbeat mood. There were a lot of those – upbeat tunes and lyrics, that is. Hard to imagine that one of the most popular titles during those years was a 1933 tune called “We’re in the Money.” Ironic since most people weren’t (in the money, that is) but sociologist speculate that tunes like this gave people who otherwise had no hope, hope. 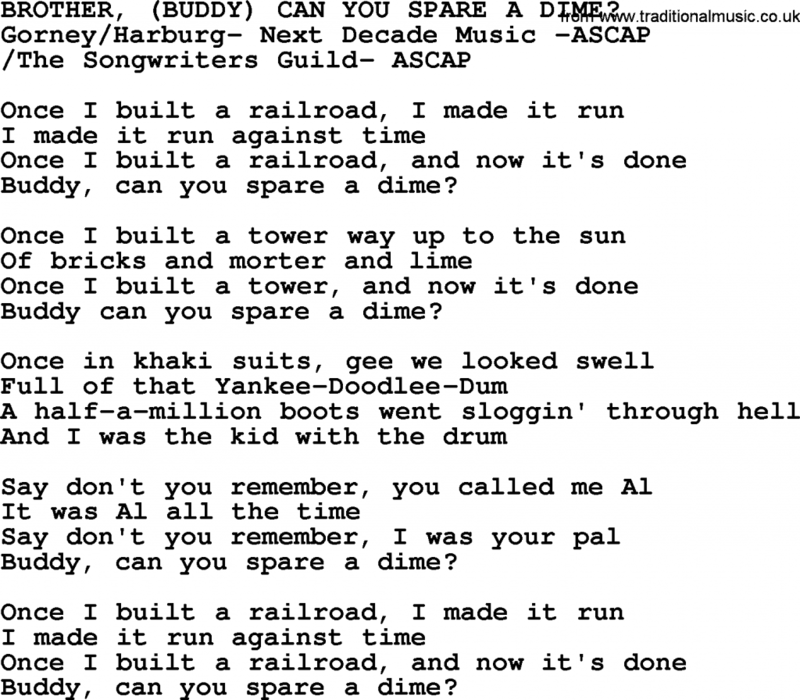 But in terms of a song that best truly reflected the era was the tune “Brother, Can You Spare a Dime” which came out in 1932 at the deepest periods of unemployment. I’ve copied and pasted the lyrics to the song below. The tune, which first was sung as part of a review titled “Americana” became the “anthem” for workers during the Great Depression. It was a thinly veiled indictment of a capitalist economic system that many people felt had “left behind” the workers that built America. The song chronicles the story of the workers who built the nation’s railroads, buildings, and infrastructure as well as those who fought in the gruesome first World War (“khaki suits”) and how the U.S. economic system seemingly deserted them during the depression and now they are forced to “beg” for money. Not only can the tune give insight into the 1930s one could also be used to gain insight into today’s modern economic malaise. Specifically, you can read through the lyrics of this song and hear the same complaints that many American workers in the Midwest have today about the loss of good-paying manufacturing blue collar jobs due to automation and international trade. NOW HERE’S MY ASK of you. Comment on this blog post. Feel free to react to anything I’ve written above but I want you to specifically comment on the lyrics of this song and how you think it gave voice to workers in the Great Depression. But wait, there’s more! In your comment I also want you to identify a relatively current song – say something in the last five years – that you think captures one element of what is going on in today’s culture, economy, or politics. If you can’t find one, feel free to write a song of your own! One important note. Let’s keep any current song one that is free from explicatives or vulgar language. I know that knocks out quite a few. But think about some of the songs that are on your favorite playlist over the past few years and think about what that song helps describe developments in today’s society, culture, politics or … economics! BTW if you want to rewrite the song below for today, you’ll have to change the numbers. A dime back in the 1930s would be about a buck fifty today ($1.47). Once I built a tower, now it’s done. Brother, can you spare a dime? Why don’t you remember, I’m your pal? Buddy, can you spare a dime? Say, don’t you remember, I’m your pal? Buddy, can you spare a dime?